Explore the lake and win - Aquamoves – Indoor and outdoor pools, fitness facilities and programs in Shepparton, Victoria. It was published in January 2016, so the information may be out-of-date. Those keen to seek and explore may find ample opportunity to do so at Victoria Park Lake this month. Seek Explore Swim is an Activities in the Park program developed by Aquamoves. It is the first time it has happened in Shepparton and provides children with the chance to learn more about Victoria Park Lake and the things that make it such a popular attraction. 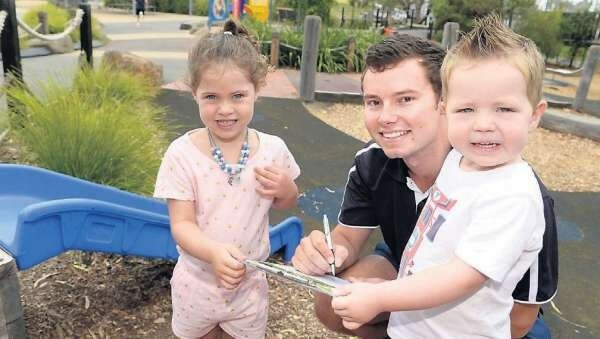 Greater Shepparton City Council healthy communities project officer Jenna Neville said the program was a good way to get children out and having fun. questions to help familiarise themselves with the area. ‘‘Sometimes people aren’t aware of what’s there,’’ Ms Neville said. ‘‘We’ve tried to make them as simple as possible.‘‘(And) there’s a bit of a variety,’’ she said. Ms Neville said after children completed the list of questions they could bring it back to Aquamoves and go into the draw to win a 12-month family pass to the centre. She said anyone who completed and submitted their form would also receive half price entry to the outdoor swim area. Seek Explore Swim started on Monday, January 11 and finishes on Wednesday, January 27. Grab a form between 8 am and 5 pm. Alexis Telford, 4, Aquamoves work group co-ordinator Ben Maude and Ryder Telford, 2, are eager for an adventure around Victoria Park Lake.